TPP Trade Deal Members Agree to Seek Way Forward Without U.S.
Countries remaining in the Trans-Pacific Partnership (TPP) agreed on Sunday to explore ways to move the trade deal forward after U.S. President Donald Trump’s pulled out in his switch to an “America First” policy. The decision, which fell short of a wholehearted commitment to move ahead immediately, came on the sidelines of a meeting of Asia-Pacific Economic Cooperation (APEC) countries that has highlighted the turmoil in global trade negotiations. Japan and New Zealand had been leading efforts to get the remaining 11 countries to continue with the agreement. “The countries are going to put forward proposals on how to take TPP forward in November,” New Zealand Trade Minister Todd McClay told reporters after the meeting of ministers, the highest level TPP discussion since Trump took office. A statement from the group said this would address “concern about protectionism” and maintaining open markets. Fears of protectionism have grown since Trump upended the old order. That changed approach has been evident in Hanoi at the meeting among countries that account for over 40 percent of world trade. New U.S. Trade Representative Robert Lighthizer has held one-on-one meetings with key partners, reflecting Trump’s emphasis on bilateral trade deals that he argues can best protect American jobs. China, putting itself forward as a global free trade champion in light of the U.S. shift, is pushing a free trade agreement to encompass the vast majority of Asian economies. The Asia trade deal it favours is called the Regional Comprehensive Economic Partnership. Officials said the United States was at odds with other APEC members over the contents of a statement due to follow the meeting on Sunday. The grouping has consistently stated support for free trade, a point emphasized by the Vietnamese hosts on Saturday. But a copy of edits to the draft statement seen by Reuters showed that the United States wanted to remove a reference to “reaffirm our commitment to achieving free and open trade” and another to the benefits of globalization. It wanted to add that free trade and investment could only be achieved through the removal of barriers and other measures that distort trade as well as to add in the word “fair” in references to trade. 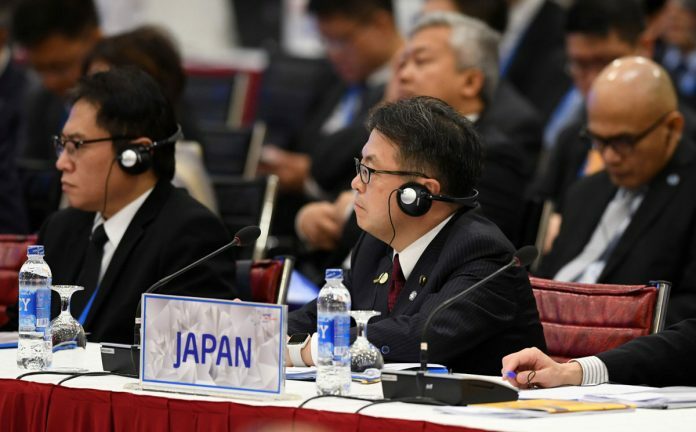 TPP trade deal members agree to seek way forward without U.S..Japan and New Zealand leading efforts to get the remaining 11 countries to continue agreement.